Join Us for the Best of Old Time Radio! 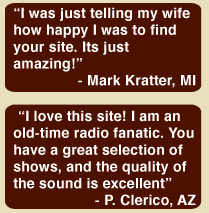 Vintage Radio Shows.com brings you over 38,000 episodes of the best Old Time Radio broadcasts! We have OTR MP3 shows for you to download and enjoy without any hassles. We guarantee it! Now on Amazon Echo - "Alexa, Play Vintage Radio!" If you have an Amazon echo then you can enjoy a few free shows just by enabling the Vintage Radio skill. Say: "Alexa, enable the Vintage Radio skill." Then whenever you're in the mood, say, "Alexa, play Vintage Radio." Don't forget your Echo makes a great speaker to use for your Vintage Radio iPhone app, the first - and the best - old time radio app in the App Store. Download our iPhone Application - Now FREE! We've brought Vintage Radio to the iPhone and iPod Touch! Our free app will play 4,000 episodes out of the box and with either an in-app subscription or a website subscription, you get access to our entire catalog of over 40,000 shows. In app subscriptions start at $1.99 for monthly access, $10.99 for a six month membership and $19.99 for yearly access. This is the perfect solution for the casual listener. You need never be without access to Vintage Radio. Tired of entertainment that leaves nothing to your imagination? Looking for a way to help your kids become more creative? Want them to be less dependent on TV and video games? Old Time Radio stirs the imagination like no other! Whether you are new to Vintage Radio or remember the time these shows were aired, you'll rediscover the joy of letting your imagination run wild. Whether you are relaxing by the fireplace, mowing the lawn, or cooking, Vintage Radio can take you to the world of our golden yesteryear, reliving a simpler era in the best days of radio. With over 38,000 episodes from 500 plus shows, you'll never grow tired of the extraordinary range of radio entertainment. For 25 cents a day, you get access to our entire library of over 38,000 episodes. With mp3 technology already on your computer, you can listen online or take the shows with you wherever you go on your iPod or iPhone. It's the best deal in entertainment. What's more, Vintage Radio is family friendly. Subscribe right now and you can be listening to your favorite show in just a few minutes. Other sites limit what you can download. No Limits Here! The site is open 24/7 for you to listen and collect at your whim. Download as many has your hard drive can hold. Put them on your iPod. Or burn your own CDs. You can listen to the best of yesteryear anywhere and anytime. "Your site is worth every cent and then some!" "My name is James Wood. I just wanted to tell you that your shows are wonderful. I do not have any vision at all, and your site works wonderfully for me. I have been a collector for a long time. Although I have most of your shows, I hope to be a member for a long time simply because I love what you are doing. You have my total support." With one membership, you get it all. Get access to 38,000+ Radio Shows and over 200 Video Classics at one low price of $7.95 per month! That is less than the cost of a movie ticket! No other site gives you unlimited access to this combination of vintage entertainment. If you'd like to kick the tires before joining, then download a few shows or listen live.